Why have we not done this before? We don’t buy grocery store cookies or cakes (with the exception of peanut butter pie from Wegmans), so why have we settled for bagged, preserved bread for so long? Thank you, Mark Bittman, for providing a simple recipe to follow in our first attempt at homemade bread. It was such a success that we now have our sights set on honey oatmeal bread and brioche burger buns and quadruple chocolate loaf cake. There’s no stopping us now. 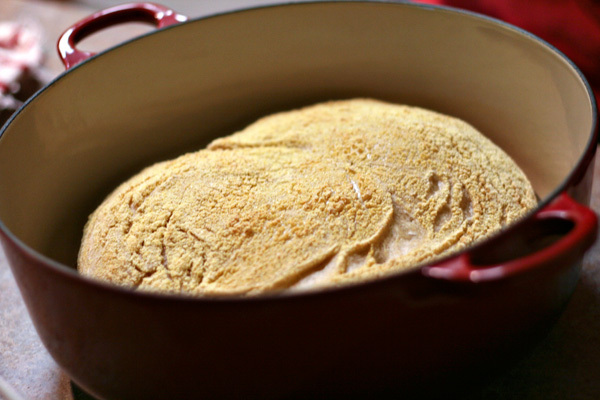 In a large bowl combine flour, yeast, and salt. Add 1 5/8 cups water, and stir until blended; dough will be sticky. Cover bowl with plastic wrap. Let dough rest 12-18 hours, at room temperature. Using just enough flour to keep dough from sticking to work surface or to your fingers, gently and quickly shape dough into a ball. 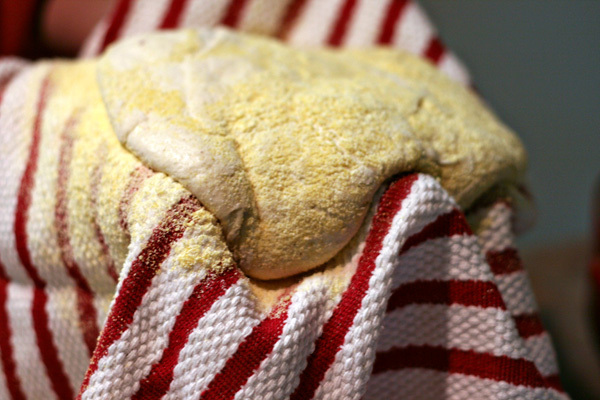 Generously coat a cotton towel with cornmeal (or flour); put dough seam side down on towel and dust with more cornmeal (or flour). Cover with another cotton towel and let rise for about 2 hours. When it is ready, dough will be more than double its original size and will not readily spring back when poked with a finger. At least 30 minutes before dough is ready, heat oven to 450 degrees. Put a 6-8 quart heavy covered pot in oven as it heats. When dough is ready, carefully remove pot from oven. Slide your hand under towel and turn dough over into pot, seam side up. (It will look messy, but that’s okay.) Shake pan once or twice if dough is unevenly distributed; it will straighten out as it bakes. Cover with lid and bake 30 minutes, then remove lid and bake another 15-30 minutes, until loaf is beautifully browned. Cool on a rack. Have you guys heard of the book, “Artisan Bread in 5 Minutes a Day”? I like it because you mix up a 4-loaf recipe (which looks very similar to yours above), but then you can store the dough for up to 2 weeks in your fridge, breaking off pieces of the dough before you want to bake it. It’s also great for pizza dough, and tastes a bit like sourdough bread at the end of the 2 weeks. http://www.motherearthnews.com/Real-Food/Artisan-Bread-In-Five-Minutes-A-Day.aspx (recipe on page 4). 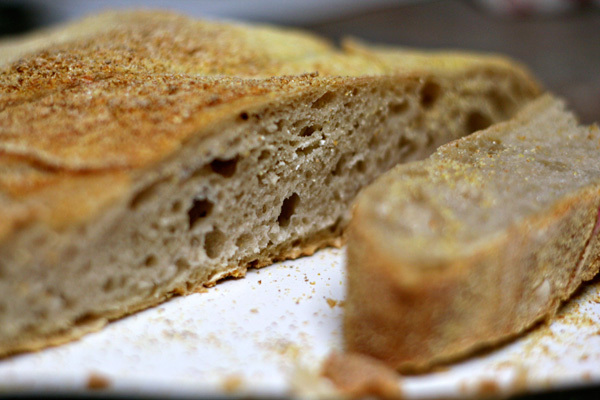 Your bread looks great too, and I definitely want to try the honey oatmeal recipe! This book is perfect! The only issue with our first batch of bread is that we weren’t able to finish it while it was still all softy and crusty. 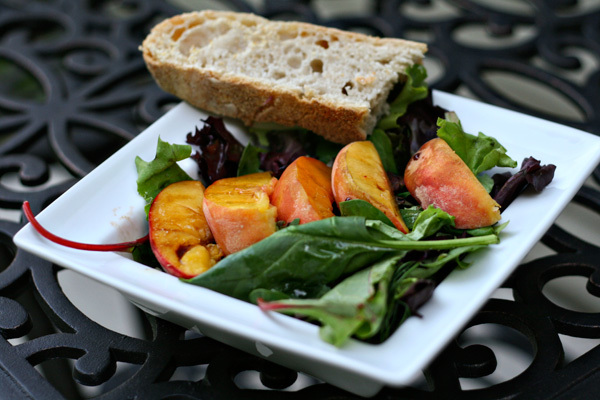 Refrigerated portions sound ideal! Thanks for the recommendation, Sarah. That bread looks SO good! But you shouldn’t be allowed to make it look that easy 😉 I accidentally acquired a bread maker (is that cheating? probably…) but I can’t even get THAT to turn out right! Looks good! I will definitely be trying this! So beautiful!!! We’ve made our own ciabatta before, and were amazed by how easy it was. Wait till you try the German breads — they are the best ever! However, we can’t find an equivalent here so decided we need to start making our own! All recipes welcome! this. i’ll be following your Feed so i do not miss the good stuff! once again, super web site please keep it up! Please pardon me if my english is not good.